“It Takes a Village,” Alejandro Diaz’s latest solo exhibition, pulls together a seemingly disparate variety of references from Minimalism, Conceptualism, Abstract Expressionism, and even British Pop to unapologetically expose the reality of quotidian life in the artist’s own personal interest in South Texas, and specifically San Antonio. Immediately, three sculptures steal the polemical spotlight. Together titled Muebles Diaz (Furniture Diaz), 2015, they comment on the power structures governing migrant labor in South Texas by mimicking the methods of objectification in the sculptures of British Pop artist Allen Jones. Rather than depicting hypersexualized women in submissive poses, Diaz’s sculptures shed light, specifically, on class’s relationship to power, evoking situations where money buys physical labor in the form of a human body. His sculptures represent presumably Mexican American laborers: one man who might be a gardener for a wealthy family supports the glass of a coffee table on his back, a woman supports a chair with the back of her thighs, and another woman—the exhibition’s central figure—extends her arms out indifferently, suggesting her own body for the role of a hat stand. 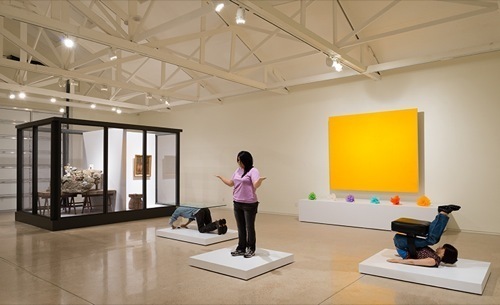 Acting as a backdrop for the three figures is a bright-yellow monochrome titled Color Field, 2015, under which sits a line of papier-mâché flowers ubiquitous in celebrations among Mexican American communities in South Texas. While there seems to be a sense of play among the myriad references, the cultural allusions to the racial, class, and hierarchical issues that exist in South Texas become transparent.